Led by top virtuoso of the banjo Howard Shep Shepherd, SHEP’S BANJO BOYS are a household name on the lips of cabaret and stage audiences, television viewers, radio listeners and disc buyers alike. The formation of SHEP’S BANJO BOYS was originally the idea of Howard’s late father Will and they have since delighted thousands with their never-ending contrasting styles until now never played on the banjo. Encouraged by his father, Howard took up the banjo at the age of 11 and shortly afterwards made several broadcasts with BBC Radio “Children’s Hour” which led to an invitation at the age of 14 to appear on BBC TV Variety Show “All your Own” broadcast from the then Lime Grove Studios. For many years Howard and his father performed as a double act working the Social Clubs and Theatres which also included several radio broadcasts. When Shep’s Banjo Boys first formed the front line led by Howard included his father Will and brother Graham (who left the band in 1975 to go to Australia). Shep’s Banjo Boys were resident at the Golden Garter Manchester for over 3 years. Sheps became a nationally recognised band with their regular musical spot on John Hamp’s top-rating show of Granada TV’s “The Comedians” (now being repeated on Granada Plus TV). Then the Show did a national tour of UK theatres including a six month season at the London Palladium. They have made guest appearances on “Pebble Mill”, “The Golden Shot” and “Wheel Tappers and Shunters Club” 1972 saw Sheps touring Sweden for 2 weeks and they also appeared on Dutch TV on two occasions. Their recording career started in 1969 and later had a 3 year contract with Pye Records. Of recent times Shep has recorded a CD featuring the banjo with guitar accompaniment which is proving popular with banjo enthusiasts. All CD recordings are available from Howard at HowardWShep@aol.com or tel. (0161) 445 2254. In 1980 Shep was booked to be the headliner at the Mid West Banjo Convention in Arkansas, USA. Shep still occasionally performs solo. Throughout the 80’s Shep’s Banjo Boys regularly entertained QE2 passengers playing background reception music in addition to their cabaret spot. 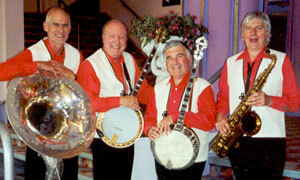 Following a very successful Comedians Reunion Show, Shep’s Banjo Boys appeared in Sunday concerts throughout July to October 2002 at the Opera house Blackpool. Shep finds his Trio and Duo is an effective unit for today’s market/budget so in addition to the band now leads SHEP’S RHYTHM ACES be it for promotional gigs at Shopping Malls, Private Functions/Corporate events/Theme Parks/Trains/Cruises/Background reception music/Weddings, etc. Sheps will travel anywhere for example Howard took his Duo two years in succession to Guernsey to entertain visitors during their Festival week and took his Trio to the Isle of Man to top an Old Tyme Music Hall which proved a great success.